Nile was selected for the artistic gymnastics 2018 World Championships in Qatar last week but injured a finger so had to pull out with only weeks to go. He has a host of medals to his name, starting even before he graduated to senior level. He was crowned British Junior Champion in March 2014 and received the Young Sportsman male award at the Leeds Sports Awards. He competed at the 2014 European Championships in Sofia in May, winning five gold medals to become the first British gymnast ever to win five gold medals at the European Junior Gymnastics Championships. ​His move to senior level for the 2014 Commonwealth Games saw him take a total of four medals, including his first individual gold medal in the horizontal bar. At the Rio Olympics in 2016, he became the first British gymnast to win bronze in the horizontal bar. This year has seen his add to his tally with five more medals at the Commonwealth Games in Australia, with gold in the men’s artistic team all-around, the individual all-around and the horizontal bar and silver on the rings and parallel bars. When Maisie was just five months old, she contracted meningitis and then septicaemia, meaning she had to have both of her legs amputated, one above the knee and one below. She was fitted with prosthetic legs at ten months and learned to walk with them. Since then, she has never looked back, learning to swim, going to Brownies, using a hand cycle through an organisation called Streetbikes and learning to ride with Riding for the Disabled. But it was when she saw her brother Finlay at his Taekwondo classes that a new passion took hold. She was keen to have a go and his club agreed that she could try. She has done so well in her new sport that she has been picked for a national GB Taekwondo Para-Poomsae academy squad, an elite training programme, and recently received her green belt. Just three weeks ago, she was invited to show off her skills during the Manchester Grand Prix in front of World Taekwondo President Chungwon Choue and a packed crowd. Amara has made history by becoming the first black actress to play the role of Cosette in Les Misérables and is currently starring in the production at the Queen’s Theatre West End of London. So successful has she been that in September she won Best Actress in a Musical in the Stage Debut Awards and she has just been shortlisted for the Broadway World award for Best Actress in a Musical. Martin Gerrard of Barclays with Susan Lees and Helen Leaf on behalf of Amara Okereke. Amara first showed an interest in music while still at nursery school where there was a struggle to get her away from the piano! She also showed her talent for dance and took up the clarinet. But it wasn’t until Year 6 when her mother realised she also had a wonderful voice after seeing her play the narrator in a school production of Joseph and the Amazing Technicolour Dreamcoat. A former straight-As Leeds Grammar School pupil, she went on to train at Arts Educational Schools in London and the National Young Music Theatre. ​Rose started her own business, Pura Cosmetics, at the age of 15 and now, just three years later, she has been recognised as one of the most promising CEOs in the country. 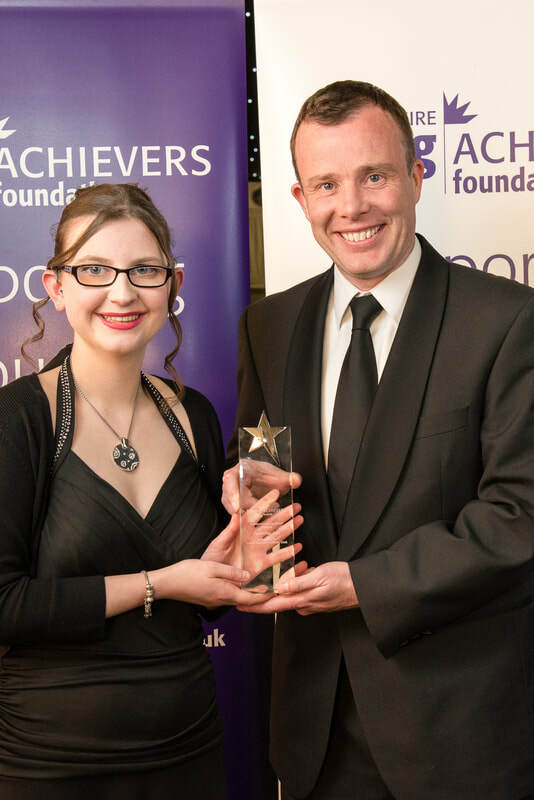 She set up the business as part of the I Know I Can Barnsley Big Challenge when she was still doing her GCSEs at Horizon College in Barnsley because she wanted to create ethical lip care products at an affordable price. She started out with investment of just £25, creating a recipe for a natural, cruelty-free, vegan lip scrub and balm and producing it at home, which she then sold at local craft fairs and Barnsley market. She now produces a range of lip care products, with the strapline “Perfect Pout”, including cocktail-inspired lines. She sells at events across Yorkshire and beyond, has an e-commerce site of her own and turned over £50,000 in 2017. And, as if she is not busy enough already, she also encourages other teenagers to become entrepreneurs, speaking at events and at schools. She won the UK Young Trader of the Year title last year and was named the top young entrepreneur by Transferwise this year. When Jennifer was nine-months-old, it became apparent that she was different from other children. Brain scans revealed an abnormality and her neurologist predicted that she would be unlikely to walk, talk or lead a normal life. But through her family’s efforts and despite the fact that she has a learning disability, special needs and is deaf, she was able to walk with a frame by the time she was three and they took her swimming and dancing to help her mobility and muscle strength. 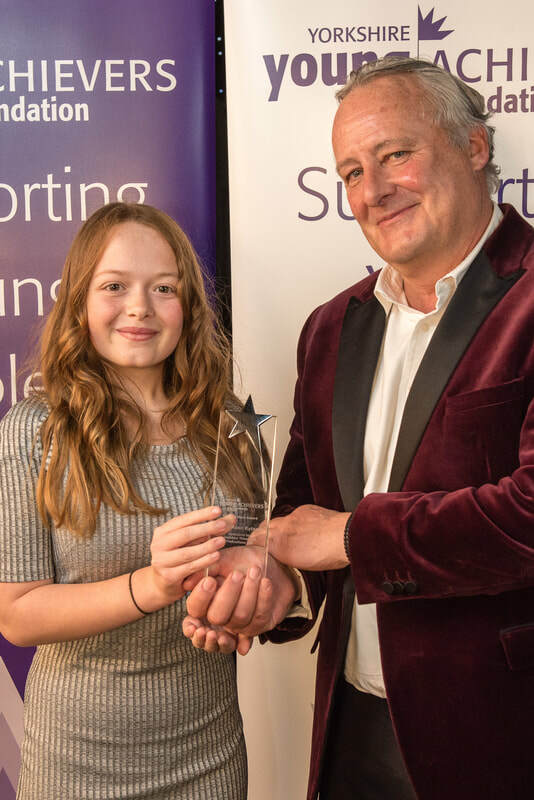 At the age of 12 she had two cochlear implants which improved her hearing but not her balance so, after consulting her physiotherapist, she joined her mum and older sister on Bradford ice rink. Although she fell over a lot at the beginning, she soon gained confidence. She started competing in 2012 for both Special Olympics and Inclusive Skating and has gained a host of gold medals in the years since. She is the first ever Yorkshirewoman selected to represent the UK in the 2017 Special Olympics World Winter Games. 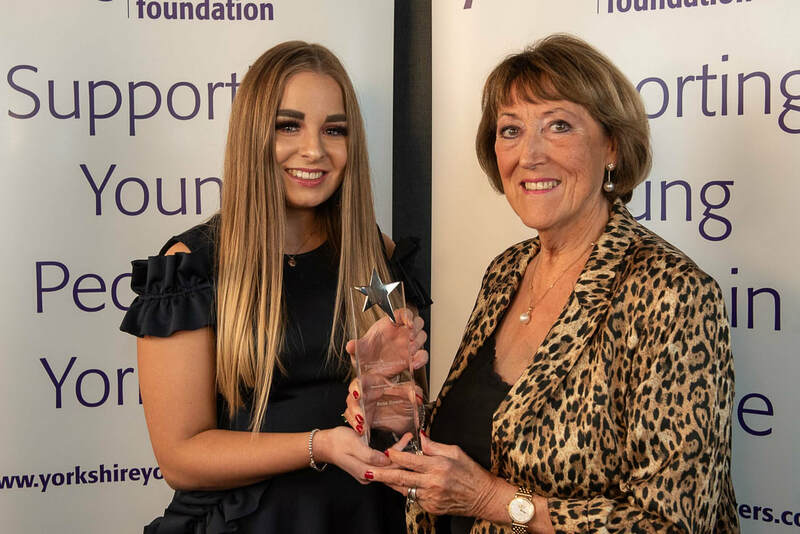 To compete in the Games in Austria, she had to raise £2,500 to participate, a challenge which she took on with cake sales, bag packing in a local supermarket, auctions and sponsored events. She went on to achieve fourth place at the Games, an amazing achievement in a world event. Dally runs a successful business in Chapel Allerton, providing web design, graphic design and print to a number of both established businesses and start-ups. But in addition to her full-time career, she also works tirelessly to ensure other people have similar success. 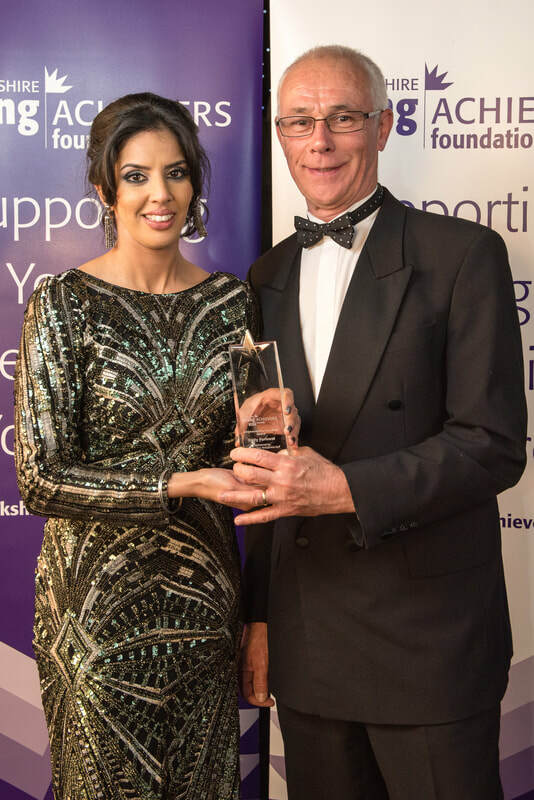 She is a valued member of the Yorkshire Asian Business Association and of the Women in Business Network and is regularly involved with business advice pop-up cafes with the Leeds City Region Enterprise Partnership. She has worked with Global Diversity Positive Action, a charity which supports young people who are not in education, employment or training to get back into the workplace by creating an on-line platform to engage its young users. She is passionate about coming up with ideas to help businesses thrive and grow and a great believer that women encouraging and supporting each other can create amazing opportunities. Olivia is the youngest team member of the Hull Homeless Community Project. She wanted to volunteer from a very young age but was always told by charities there was a lower age limit so she started with her own efforts, such as buying lunch for a homeless person. She came to the Project’s notice and they were able to find a way for her to become involved, by raising awareness and working on their outreach programme. Her dedication and commitment led to her being asked to become the first official patron of the charity. She has worked in the community kitchens that the charity has organised in the past, set up her own Facebook page, Olivia’s World, to share her experiences and engage with others, and has recently appeared on BBC radio to discuss homelessness. She gives up her spare time to volunteer at several other local community groups, including Youth in Nature which focuses on conservation and Little Stars, a theatre group for children when she helps the youngsters get ready for their performances. 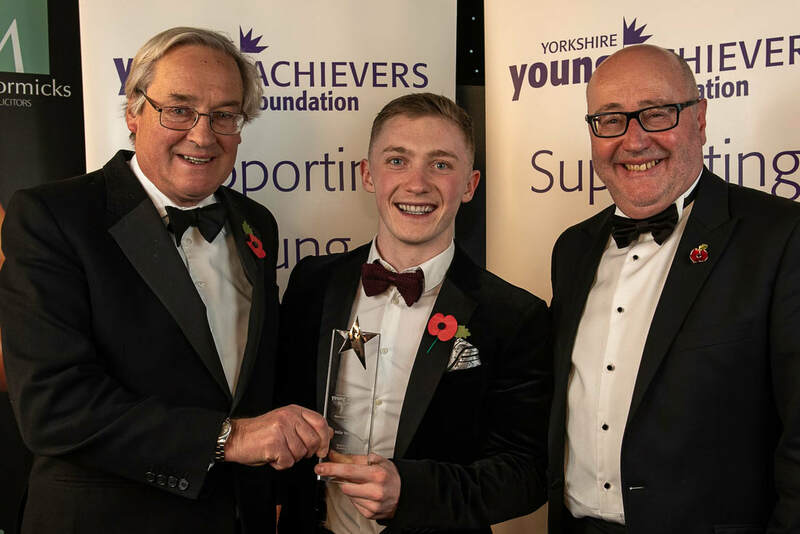 The Special Award is made to friends and supporters of the Yorkshire Young Achievers Awards who have gone the extra mile to help raise funds to support young people in the region. 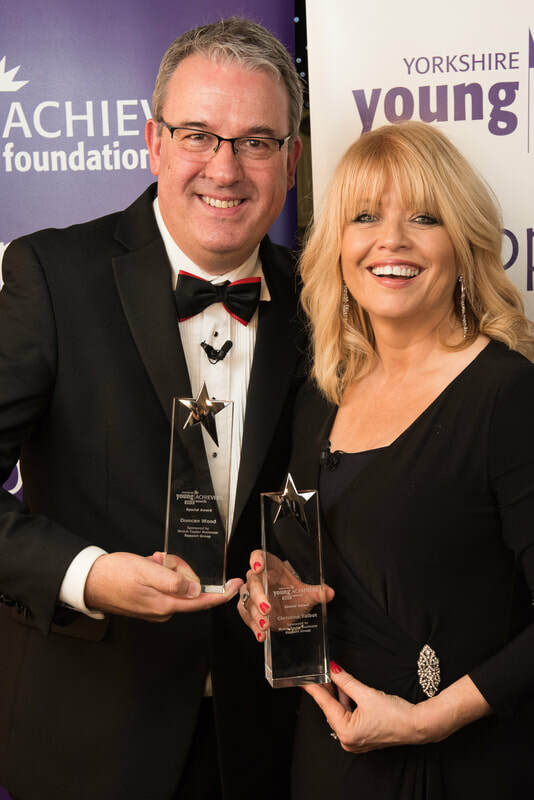 Christine and Duncan of ITV Yorkshire have supported the Awards almost since their inception and co-host the event every year. 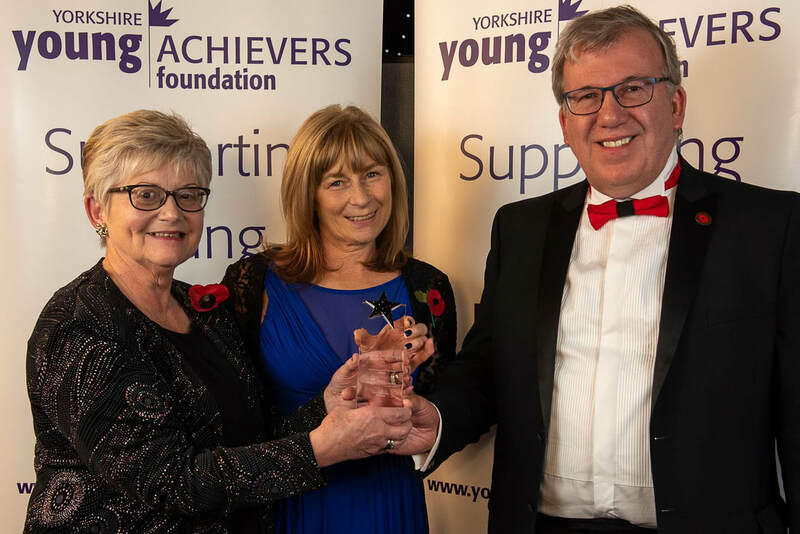 They were part of the founding group who set up the Yorkshire Young Achievers Foundation in 2010 to distribute the proceeds of the Awards direct to young people and organisations working with them in Yorkshire. They became Patrons of the charity in 2017. In addition to presenting the Awards on the night, they have devoted their personal and professional time to arranging the award launches every spring, interviewing winners, making films and taking part in the judging sessions.